This single body soundbar has eight array speakers in the centre and subwoofers in the stands at both ends. With a built-in 76 W digital amplifier to power the speakers, it produces sound with exceptional power and presence. The stands are equipped with dual built-in subwoofers that have large 8.5 cm drive units. Combined with the high-stiffness bass reflex duct and wide, large volume cabinet, the unit will deliver clear, rich and deep bass for movie sound effects and music. The independent right and left channel configuration provides superior sound imaging. The YSP-1400 is compatible with popular surround sound formats, such as Dolby Digital and DTS Digital Surround, so you get the full effect of multichannel movie sound. Enjoy the sound of music or movies from your smartphone or tablet wirelessly. While watching the screen, it's easy to perform select, play and stop operations, as you enjoy sound backed by the power of the YSP-1400. It has a Bluetooth standby mode, so by linking to Bluetooth on/off via the terminal, you get the convenience of the YSP-1400 turning on and off automatically. 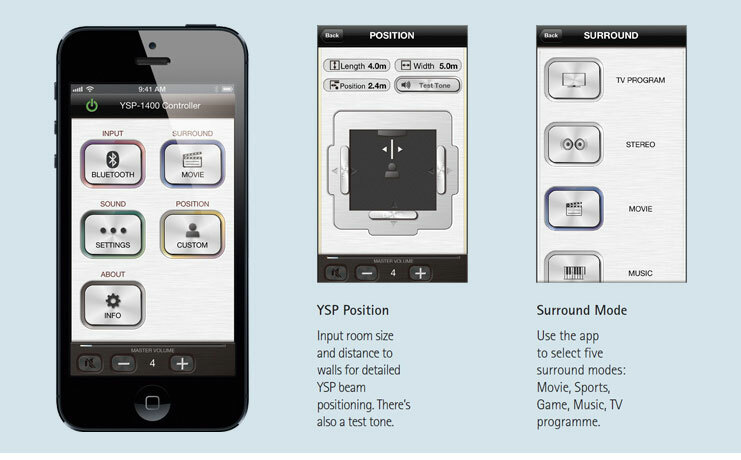 The YSP-1400 is compatible with a free controller app (HT Controller) for iOS and Android. The easyto-see and easy-to-use operating screen uses icons to let you easily perform a variety of operations while watching your smartphone or tablet screen. You can also make detailed settings for the beam sound output. 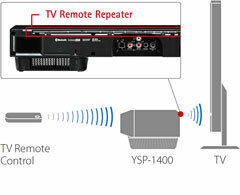 The YSP-1400 connects to a TV via a single cable, so setup is quick and easy. It provides two digital input terminals (optical/coaxial). 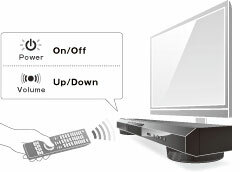 Even if the YSP-1400 blocks the TV’s remote control signal, the TV Remote Repeater on the back transmits the signal to the TV so operation is not affected. The YSP- 1400 can “learn” the TV remote control operation, so you can use the TV remote control to turn the YSP-1400 on and off and to adjust its volume. 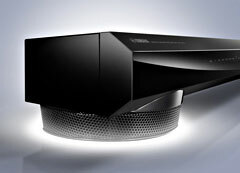 This welcome feature, made possible by Yamaha-developed technology, maintains a consistent volume level between different channels, programmes, commercials and input sources. It can be switched on and off. Its slim body with subwoofers integrated into the stands has no sharp angles at the top and bottom of the front panel. It will fit neatly and attractively in front of the TV.